It's 03:07 in Gatlinburg, USA right now. Anakeesta's Firefly Village View of Anakeesta's Firefly Village with the Great Smoky Mountains in the background. 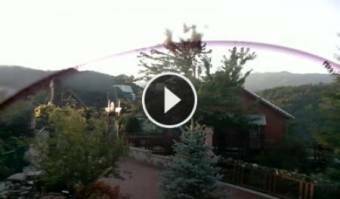 Gatlinburg, Tennessee: Panocam Rowdy Bear Mountain, 0 miles away. Whittier, North Carolina: Conleys Creek, 21.3 miles away. Sylva, North Carolina: Town View, 28.5 miles away. Black Mountain, North Carolina: City View, 66.2 miles away. Morganton, Georgia: East Fannin Elementary School, 72.3 miles away. Chimney Rock, North Carolina: Chimney Rock State Park, 72.8 miles away. Johnson City, Tennessee: Bank of Tennessee, 75.6 miles away. Johnson City, Tennessee: Buffalo Mountain, 75.6 miles away.